When snow has melted from the high passes and all the huts are open, the treks are best tackled from late June until the end of September. 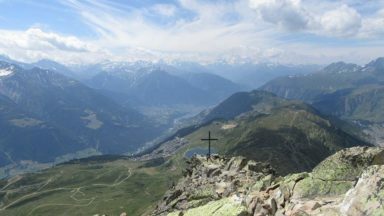 Since these are multi-day routes there are no bases as such, but the treks either bein at, or pass through, Klosters, Lavin, St Antönien, Nenzinger Himmel and Brand. 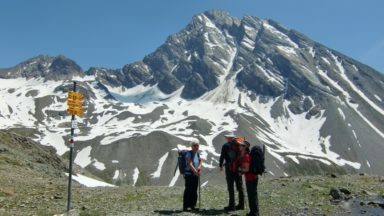 No technical difficulty or special equipment will be required to tackle these routes under normal summer conditions, but the 7-8 day Tour of the Silvretta has several challenging and remote passes to cross and is suitable for experienced trekkers. The 5-day Prättigauer Höhenweg and 7-8 day Rätikon Höhenweg are both moderate. 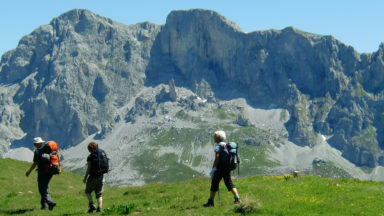 Three great trekking routes among such peaks as Piz Buin, Piz Linard, Dreiländerspitz, Schesaplana, Sulzfluh and Drusenfluh, crossing the Vereina Pass, Furcletta, Pass Futschöl, Hochmaderer Joch, Gross Furgga, Verajöchl and Plasseggenpass, and visiting villages like Lavin, Guarda and St Antönien. The Silvretta has snowfields and glaciers, the Rätikon is limestone and almost dolomitic in grandeur. Straddling the borders of Austria, Switzerland and Liechtenstein, the limestone Rätikon Alps reach into the snow-bound and glacier-hung Silvretta Alps to provide a richly diverse series of landscapes. 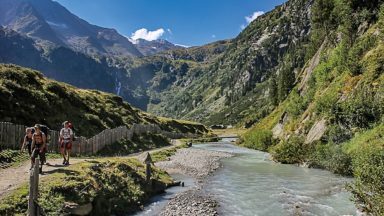 The Tour of the Silvretta, the Prättigauer Höhenweg and the Rätikon Höhenweg, all within easy reach of Klosters, have been devised to help trekkers explore the best of the region. Given sifficient time they can also be combined to create a continuous 2-week tour. The Silvretta and Rätikon may stand together, but their geology and landscapes are vastly different. 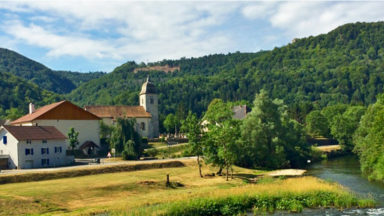 Together, they feature picturesque alpine villages, a large selection of mountain huts and a range of walkers' passes to provide excellent trekking. 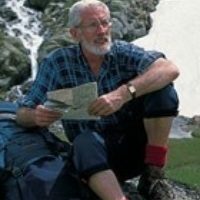 This guide describes all three treks, step by step, as well as 12 short routes linking some of the area’s most idyllically-located huts, for those who prefer to plan their own tours. 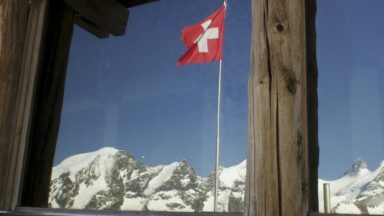 A Tour of the Silvretta Alps - this fairly strenuous hut-to-hut tour makes a counter-clockwise circuit of the Silvretta Alps over the course of about a week. With magnificent scenery throughout, there are several rugged passes to negotiate and a number of beautiful valleys to wander through. The Prattigauer Hohenweg - a medium-grade multi-day route that works its way along the south flank of the Silvretta and Ratikon mountains between Klosters and Landquart. This very fine trek is demanding in places, but it rewards with numerous memorable views especially of the abrupt walls of the Ratikon mountains. The Ratikon Hohenweg - the Ratikon Hohenweg Nord runs along the Austrian flank of the mountains, while a roughly parallel route known at the Ratikon Hohenweg Sud takes a similar course on the Swiss flank. By linking them at either end of the mountain range, a first class hut-to-hut circuit can be achieved. Along with detailed route descriptions, maps, information on travel to and around the area, practical tips on equipment and trekking logistics, as well as details on climbable peaks and points of interest, are all included. All but a very small section of the Tour of the Silvretta Alps is found on the Kümmerley + Frey Wanderkarte, Unterengadin (Engiadina Bassa) map at 1:60,000 scale. The only section missing includes Klosters and Monbiel at the start and finish of the trek, but this is covered by the same publisher’s Prättigau-Albula sheet. Trails and huts are clearly marked in red on both maps, whose scale should be perfectly adequate for most occasions. Should you require greater detail, the DAV has produced an excellent 1:25,000 sheet covering all the Austrian side of the Silvretta, as well as a good proportion of the Swiss flank, under the heading Alpenvereinskarte 26 Silvrettagruppe. Kümmerley + Frey’s Prättigau-Albula not only overlaps a section of the Tour of the Silvretta, it’s also ideal for trekkers following the Prättigauer Höhenweg where the whole route is covered. The same sheet (Prättigau-Albula) includes all of the Rätikon Höhenweg, although if you plan to approach Nenzinger Himmel or Brand from the north, you will need an Austrian map such as Freytag & Berndt’s 1:50,000 scale WK374 which covers the Austrian flank of the Rätikon and Silvretta Alps as far east as the Fimbertal. Available locally, a very fine map at a scale of 1:40,000 with the title Schesaplana Wanderkarte shows all the huts and footpaths highlighted in red (the Prättigauer Höhenweg is marked in green). On the reverse is a depiction of the main footpaths with estimated walking times between selected points. This sheet includes the whole of the Prättigauer Höhenweg trek and that of the Rätikon Höhenweg, but does not extend into the Silvretta range. page 65: The route to the Tübinger Hut is now signed from the track/dirt road you join after crossing the Kromer Bach. Walk up the track for about 20m where you will then find waymarks on the right. page 126: Brand has an ATM if you’re running short of cash.